I graduated high school with a bilingual mention. I was part of the French Immersion program from kindergarten to grade 12. I have my grade 10 piano from the Royal Conservatory of Music. Currently, I am in my last term of the Concurrent Music Education degree at Brandon University. What accomplishments (awards, scholarships, volunteer work, organizations, memberships, etc) are you proud of? I am most proud to be a member of BUSMEA. BUSMEA is the Brandon University Student Music Educators Association. I have been a member for four years and have held various positions on the executive council for three years, including Student Representative, Vice-President and this year’s President. This year, I have had the opportunity the help the Brass Ensemble at Earl Oxford School. I am very proud to help them because I am not a brass specialist. By directing this ensemble, I not only have the chance to help the students develop their music skills, but I also have the opportunity to further my abilities on all the brass instruments. I was born and raised in Estevan, Saskatchewan. I was enrolled in the French Immersion program at our school and stayed in French Immersion all the way through grade twelve. I started taking piano lessons in grade one because my sister was taking them first. And I never quit taking lessons. I began learning the flute in our school band in grade six and joined all the possible ensembles I could. During this time, I also began to play many different sports, including basketball and soccer. When I got to high school, I continued being very involved in sports and music. I was on the senior girls’ soccer team for four years and was co-captain of the team in my senior year. I also played senior girls’ basketball for three years. In grade nine, I picked up my third instrument, the string bass, so that I could play in the jazz bands. By grade ten, I became a member of the Jazz 1 ensemble. When I decided to continue my education after high school, the main thought that I had as to what field of study I would continue was—I cannot imagine not taking piano lessons anymore. I had been taking piano lessons for so long, that I truly couldn’t imagine what life would be like without music anymore. That’s when I realized that I wanted to pursue music, but I did not really want to become a teacher. Then the idea of music education, to become a band director, came to mind and that idea seemed to fit correctly. I couldn’t imagine doing anything else. I had always been extremely involved in all the music activities in the school and it just seemed like the logical profession to choose. My philosophy in life is to do the best that you can and to live day by day. I believe that everyone has different skills to bring to the table and that people can only do the best they can. As long as you do your best, then that is all you can do. I also believe in living day by day. Working on this degree, I have had some extremely difficult terms and classes. The best way I have learned to make it through anything difficult is to think, I can do anything for one day. Just thinking about making it through one day at a time, doing the best that you can each day, is what I believe in. I see myself as a music educator, teaching in a school, either middle school or high school. I am extremely excited to graduate and to continue searching for the right job so that I can help bring my love of music to the next generation. 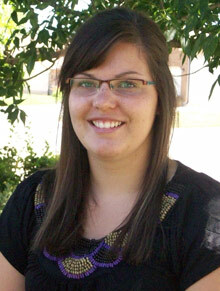 Erin is in her fifth year of the B Mus/B Ed concurrent program at Brandon University. With her “I can do that” attitude, Erin makes things happen. As President of the Brandon University Student Music Educators Association she rallies music education students in the building and works as a clinician and volunteer with students across the province. A native of Saskatchewan, she demonstrates that an outstanding work ethic and an ability to anticipate what people may want or need creates a leader who makes a difference. Her sense of humor, attention to detail, and organization are qualities that allow her to excel on our campus.